Location: Nasiriya, Iraq Grid Reference: 30° 57' 38" N, 46° 6' 18" E.
Home of the Ziggurat of Ur and the reputed birthplace of the prophet Abraham. Ur was the capital of the Sumerian civilisation and once a great harbour city on the banks of the Euphrates river, until it changed its course and the city became lost, so that Wooley was forced to dig vast hole over 40ft deep to uncover the lowest levels of the city..
Ur was first found and excavated in 1853 and 1854 by British consul J. E. Taylor, who uncovered the then sand-covered remains of the famed ziggurat. 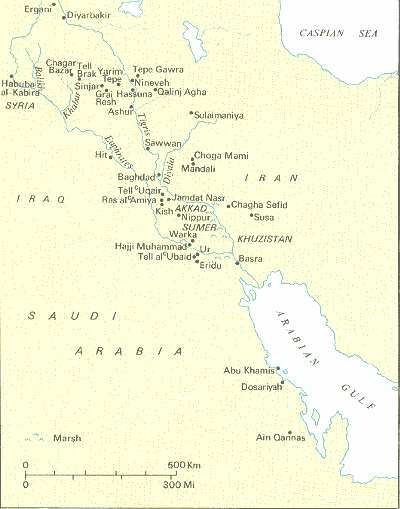 This city, which is mentioned several times in the Bible as Ur of the Chaldees (referring to the Chaldeans, whom settled in the area about 900 BC) as the birthplace of Prophet Abraham "Ibrahim Al-Khalil" (pbuh), was one of the most important cities of the Sumerians in the 4th and the 1st half of the 3rd millennium BC. It was also considered as one of the most active and full of life cities in southern Mesopotamia during the following centuries. In former days it stood on the banks of the Euphrates, until the river changed its course. According to ancient records, Ur had 3 main dynasties of rulers who at various times, extended their control over all of Sumeria. 2,670 BC - The founder of the First Dynasty of Ur was the conqueror and temple builder Mesanepada , the earliest Mesopotamian ruler described in extant contemporary documents. 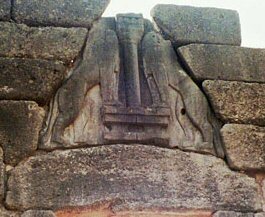 His son Aanepadda (reigned about 2650 BC) built the temple of the goddess Ninhursag, which was excavated in modern times at Tell Al-Obeid, about 8 km north east of the site of Ur. 2,340 BC - Ur was captured by King Sargon of Agade, and this era, called the Akkadian period, marks an important step in the blending of Sumerian and Semitic cultures. After this dynasty came a long period of which practically nothing is known except that a 2nd dynasty rose and fell. 2113 - 2095 BC - Ur-Nammu, the first king of the 3rd Dynasty of Ur, who revived the empire of Sumer and Akkad, won control of the outlet to the sea about 2100 BC and made Ur the wealthiest city in Mesopotamia. His reign marked the beginning of the so-called renaissance of Sumerian art and literature at Ur. The descendants of Ur-Nammu continued in power for more than a century, or until shortly before 2000 BC, when the Elamites captured Ibbi-Sin (reigned 2029-2004 BC), king of Ur, and destroyed the city. US returns Ur, birthplace of Abraham, to Iraq. 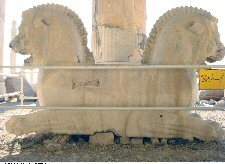 'UR, Iraq - The US military on Wednesday handed control of ancient Ur, the biblical birthplace of Abraham, back to Iraqi authorities, who hope now to re-launch it as a major tourism site. "The local government will begin the renovation of the archaeological site in cooperation with the Ministry of Tourism to be ready to receive tourists from the region but also across Iraq," said Hassan. 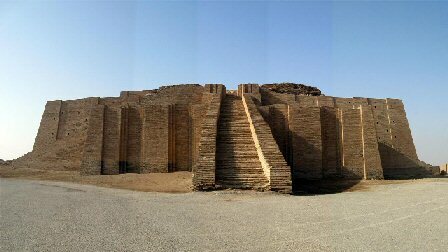 The Great Ziggurat of Ur was a temple of Nanna, the moon deity in Sumerian mythology, and has two stages constructed from brick: in the lower stage the bricks are joined together with bitumen, in the upper stage they are joined with mortar. The temple was built in 2,100 B.C. during the reign of Ur-Nammu and stands 70 feet (21 m) high). An early image of the Ziggurat from the 1920's. An image of the building after restoration. Artistic reconstruction of the original complete structure. The ziggurat is believed to have been the precursor to the Egyptian pyramids, which began with the Djosers 1st Dynasty Step-pyramid at Saqqara. The city was first excavated in 1853 and 1854 by British consul J. E. Taylor, who uncovered the then sand-covered remains of the famed ziggurat of Ur which was dedicated to the moon god Nanna in Sumerian mythology and the Babylonian equivalent Sin in Babylonian mythology. However, the excavation of the actual city did not happen until 1918 when the British Museum funded an excavation under the leadership of British archaeologists Reginald C. Thompson and H. R. H. Hall. Though excavation ceased in 1919, it was restarted in 1922 in a joint expedition by the British Museum and the University Museum of the University of Pennsylvania under the direction of British archaeologist Sir Leonard Woolley. Ending in 1934, this last expedition was the one that provided the most information on this mighty city of over 200 000 residents at its peak. 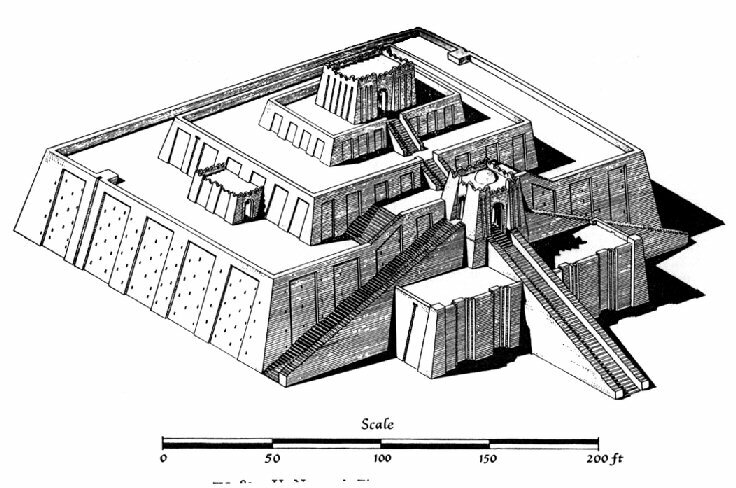 In addition to excavating the ziggurat completely, the expedition unearthed the entire temple area at Ur and parts of the residential and commercial quarters of the city. 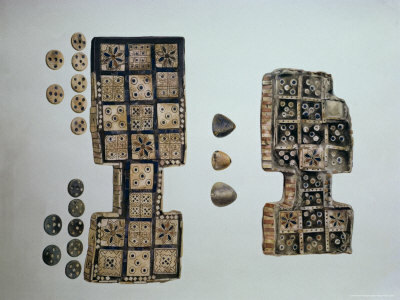 The most spectacular discovery was that of the Royal Cemetery, dating from about 2600BC and containing art treasures of gold, silver, bronze, and precious stones. The findings left little doubt that the deaths of the king and queen of Ur were followed by the voluntary death of their courtiers and personal attendants and of the court soldiers and musicians. Within the city itself were discovered thousands of cuneiform tablets comprising administrative and literary documents dating from about 2700 to the 4th century BC. The deepest levels of the city contained traces of a flood, alleged to be the deluge of Sumerian, Babylonian, and Hebrew legend. Most of the treasures excavated at Ur are in the British Museum and the University of Pennsylvania Museum of Archaeology and Anthropology. Golden Ram in Bush. Ur. Royal Graveyard - c 2,500 BC. The tube rising from the goat's shoulders suggests it was used to support something, most likely a bowl. Among the estimated 170,000 valuable antiquities that filled Iraq's Baghdad Museum prior to its tragic looting in April 2003, some of civilization's oldest musical instruments were proudly exhibited. The Gold Lyre (replica, right) was one of more than a dozen Sumerian stringed instruments discovered at the ancient site of Ur in 1927. Sumerian cylinder Seals: Lapis Lazuli seal. C. 2400 - 2,500 BC. (B16852). 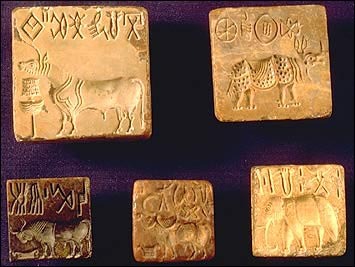 The first objects unearthed from Harappa and Mohenjo-Daro were small stone seals inscribed with elegant depictions of animals, including unicorn-like figures, and marked with Indus script writing which still baffles scholars. These seals are dated back to 2,500 B. C. Source: North Park University, Chicago, Illinois. 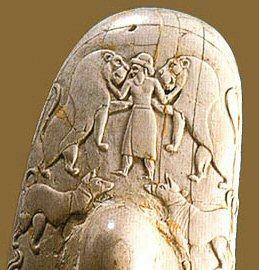 The first cylinder seals belonged to the now long dead civilization of the Sumerians, the inhabitants of Nippur, Lagash, and other cities on the Euphrates and Tigris rivers in what is now Iraq. They spoke a strange language -- neither Semitic nor Indo-European, the family of languages spoken by many later civilizations and the most current inhabitants of the Middle East. Sumerian was an tongue, bearing resemblance to such diverse languages as Turkish, Finnish, Japanese, and Dravidian. Indeed, it was probably some version of the latter tongue that was spoken by their neighbours, the early inhabitants of the Indus river valley. 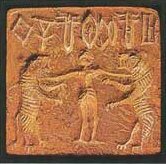 These Indus valley people developed, soon after the Sumerians, their own civilization and unique style of seals. Modern speakers of Dravidian languages are scattered all over the Indian subcontinent, including remnants in Afghanistan and a large number of Tamils in southern India. Seal impressions have been found in the ancient city of Harrapan, in the Indus River valley (modern Pakistan), that had been made by seals found in Lagash in Sumeria (modern Iraq). From 3,600 B.C. in Sumer, and a little later in the Indus Valley, we can find seals made out of a rare high-quality stone, lapis lazuli. These stones could only have originated from rather distant and inaccessible mines in Afghanistan. Gilgamesh: From Europe to the Indus Valley. 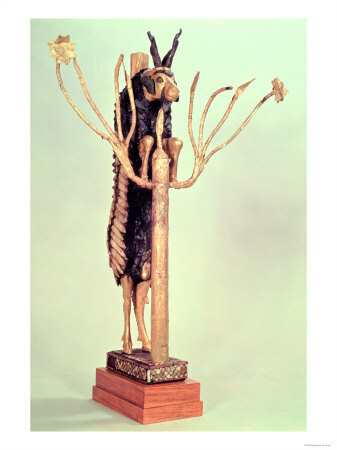 It was long suspected that there was a connection between the early dynastic Egyptians and the Sumerians. The Knife found at the Royal cemetery in Abydoss (right), with its depiction of Gilgamesh, is proof enough, but the following information suggests that this prehistoric cultural link may have been stronger than once thought. 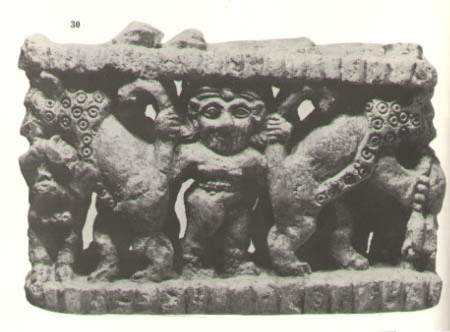 Gilgamesh in Mohenjo Daro, Indus Valley (left), Sumeria (centre) and Abydoss, Egypt (right). The 'Gilgamesh' figure is an iconic Sumerian image, found in other prehistoric civilisations such as Early Dynastic Egypt and the Indus Valley. The same image with a central figure, but with felines flanking a 'female' and not a male figure can be traced back through other prehistoric locations such as the Mycenaean, Anatolian and Maltese civilisations. If we go back further into Anatolian prehistory to Catal hoyuk (8,000 B.C. ), for example, we can also compare the figurine of a large female sitting upon a throne flanked by either Lions or leopards (right). 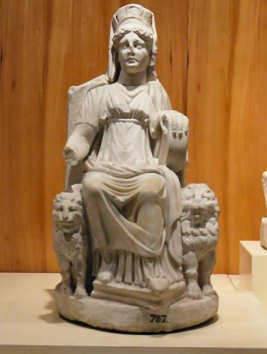 The Prehistoric European Earth Goddess or Cybele (left), is also often depicted enthroned with lions as was the Minoan mountain goddess (centre). 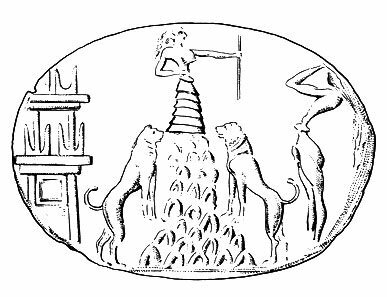 It is interesting to note, in relation to the prehistoric images of an Earth-Mother-Goddess with Lions on either side, that the Egyptians used the symbol of two lions 'Aker' to represent the horizon. 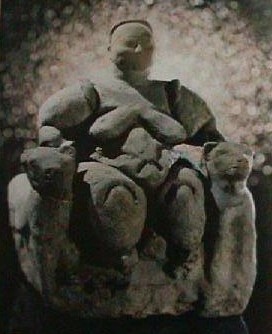 In this context, we can see through these earlier iconic images of a female Earth-Mother-Goddess flanked by felines, a depiction of the literal Earth itself. The same symbols were later used as 'guardians' of important cities, temples etc. 7). Jane McIntosh. 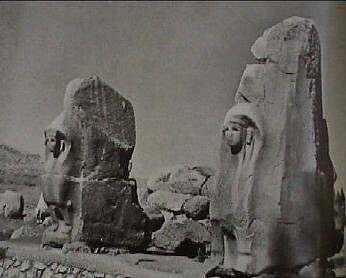 Ancient Mesopotamia. 2005. ABC-CLIO Publ.